Alongside traditional barbecue sauces and fixins, an unusual accoutrement kicks things up a notch at Come and Take It BBQ in Alpine. A salsa with origins in Northern Mexico known as chile macho graces the eatery’s tables, as it does many across West Texas. Owner Scott Turner uses a chile macho recipe he learned from his childhood best friend’s mother, Terlingua resident Dominga Acosta. “Dominga was like my second mom,” Turner says. “She made it fresh for her family every day.” Acosta, now in her 70s, learned how to make it from her mother—her family’s roots in the region go back 200 years. “Chile macho was in all the houses in Santa Elena and Castolon when I was young,” Acosta notes, referencing historic Big Bend villages. What sets the salsa apart is its roasted chiles—normally jalapeños or serranos—that impart a smoky flavor. 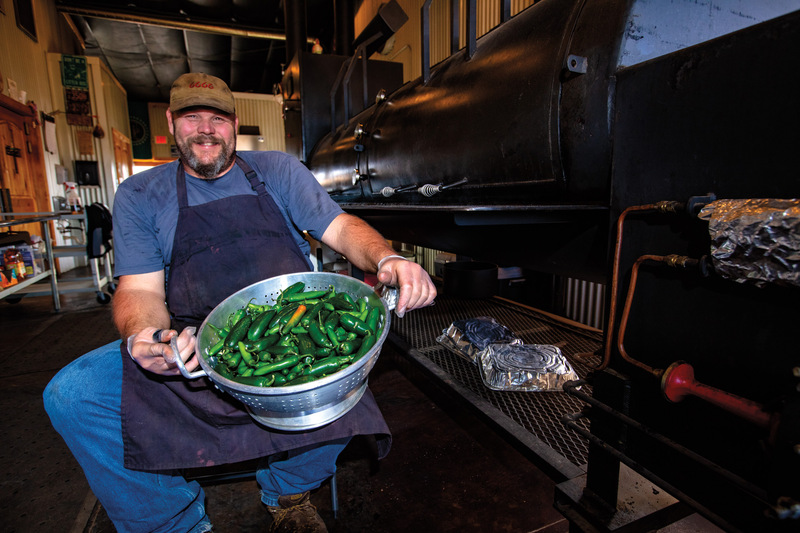 At Come and Take It BBQ, which opened in Fort Davis in 2013 before moving to Alpine in 2016, pitmaster Brian Bourbon smokes the chiles in the barbecue pit for several hours to give them extra flavor.